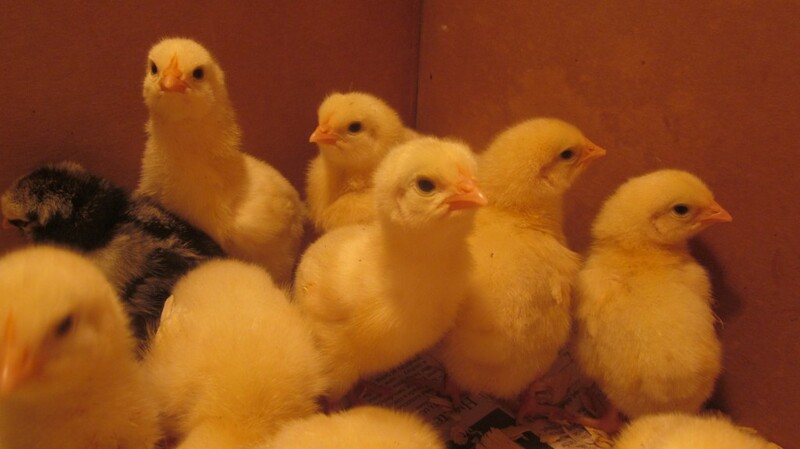 Remember our Cornish cuties that started out in the basement as little chicks? That was just 8 weeks ago. Here they were at that stage. They are incredibly soft and cuddly and plump at this age . . .
Baby Cornish don’t stay baby-faced for long! We moved them into the stock tank in the garage when they outgrew their basement box. We could still carry them all in one box at that age. 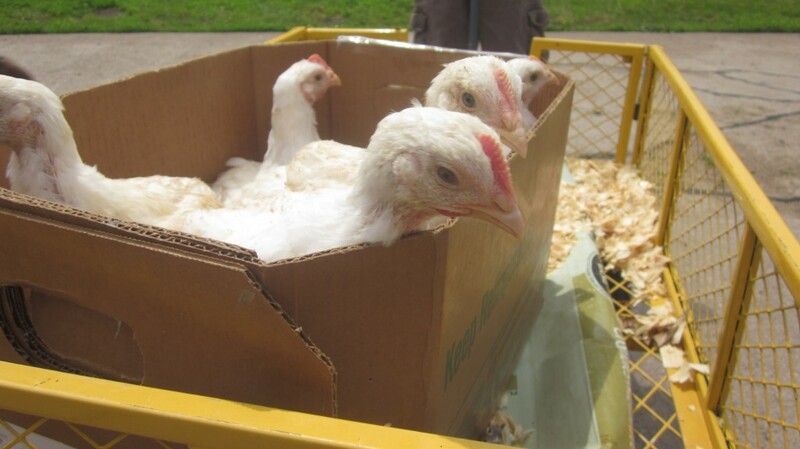 It didn’t take many weeks for the chicks to outgrow the stock tank, and since they were fully feathered out, (and thus not too delicate to withstand cool nights and hot days), we moved them (via wagon) to their PVC-and-chicken-wire enclosure outside. We had to step up our vigilance, setting up TWO (count ’em, two) live traps, after the first night when something sneaky reached underneath their enclosure and scooped one out. We caught a whole slew of varmints, the first one probably being the original culprit. I tell you, I can set up that live trap in my sleep (and often have). I have to clip it closed during the day. I was catching too many of my flock of chickens in it. This fellow is not very happy about being caught, empty-handed, at that. We haven’t lost another chicken (knock on wood!) since, although now at their size . . . I would be surprised if anything but the biggest varmint around could wrestle one down. 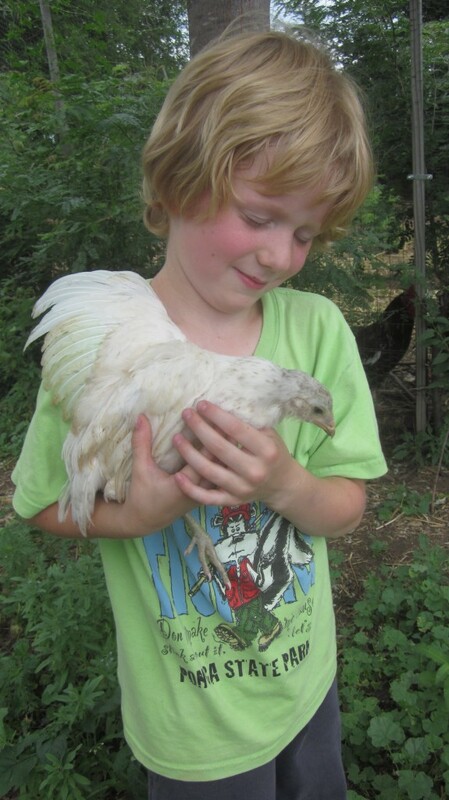 For comparison’s sake, here’s a picture of little Mack holding one of the Americauna chicks that we purchased at the same time that we purchased the Cornish. This is a pullet and will be part of next year’s flock of layers. She’ll take a while to grow up, though, obviously, before she’ll be providing lovely blue eggs for our breakfast table. Look at those bitty little blue-gray feet! Cute. The little pullet’s wing is flopped up on Mack’s shoulder, but you can still see how small she is. 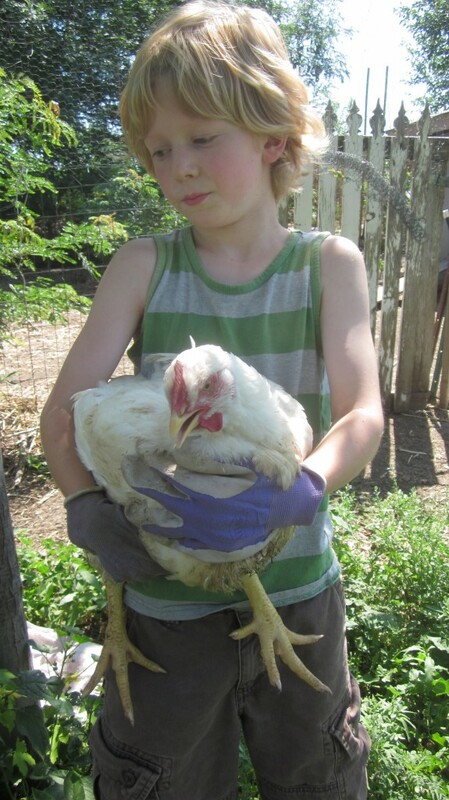 And here’s little Mack (below) holding one of the Cornish chickens. Both of these chicks are about 8 weeks old. The Americauna probably weighs less than a pound, and the Cornish is well over 5 pounds by now. Take a look at the feet, for comparison. Yikes. Pretty incredible, huh? You can see why mealtimes (and all the time is mealtime) are so important to these birds! I’ve got a butchering date in two weeks, at a small processor in Brainard, Nebraska. 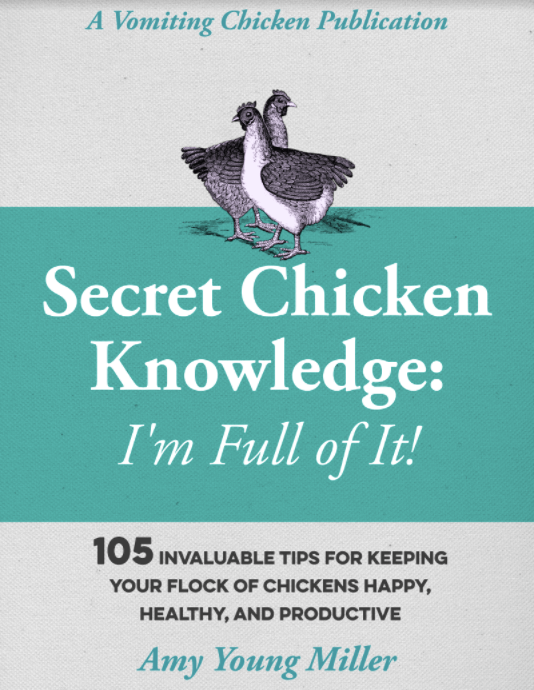 I have plans for that day. . . . it’ll be a bit of a celebration for me, since I spend an inordinately large amount of time each day toting food and water to all these chickens. Phew. Amalia and I had a bit of an adventure in Brainard last year, and I’m planning a continuation of that adventure this year, too. But I’m not planning on getting lost first. Hi Amy – I don’t know how you do it! I have a dog & 2 cats and that gets a bit much at times 😉 I enjoyed reading about you & your life in Nebraska. Very different from things here near downtown Orlando & bringing up my insatiable need to travel. Here’s to adventures! That’s a nice update. I am not sure we have pullets that can lay blue eggs in India …is it like the normal eggs we get. How do they taste? Rainbow, many people think that the blue-green eggs of the Ameracauna are the tastiest chicken eggs of all! Amy, I always enjoy getting a slice of your life in Nebraska. Never a dull moment at your place! What a difference in those two birds! And those feet! Deb, it’s so sweet to hear from you again! Thanks for your comments! splendid post. What’cha gonna cook? Ohhh, Anita-Clare, I’ve been making plans . . .. I’ll share them, don’t you worry! Wow, that’s dramatic growth. Hope they taste good! I know from experience, Melinda, that they’ll be quite delicious! Wow. The difference in size batween the pullets is amazing. Fancy living your life eating–only to be eaten yourself. Isn’t it, Francene? Amazing to me, too, and I’ve been watching it all along! hmmm, your going to market in two weeks. Sounds like a great time to stop by for dinner..When you were talking about cornish I was thinking about those little bitty hens that they charge way to much for at the market. These are way bigger than that. Enjoy and share your recipes. Noo, those little bitty over-priced “Cornish hens” are not for me. 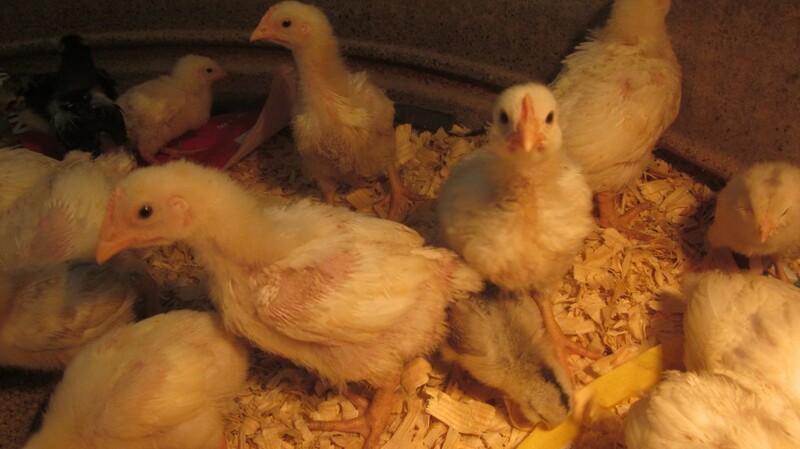 They are the VEAL of the chicken world, the same breed as my Cornish Cross chickens, but butchered when they are still very young (just a few weeks old). My chickens will be much larger by the time we butcher them, and you and your lovely wife are welcome to stop by for roast chicken any time! 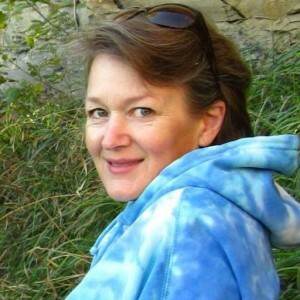 Amy thanks for the update…I have enjoyed reading about the hen’s adventures. 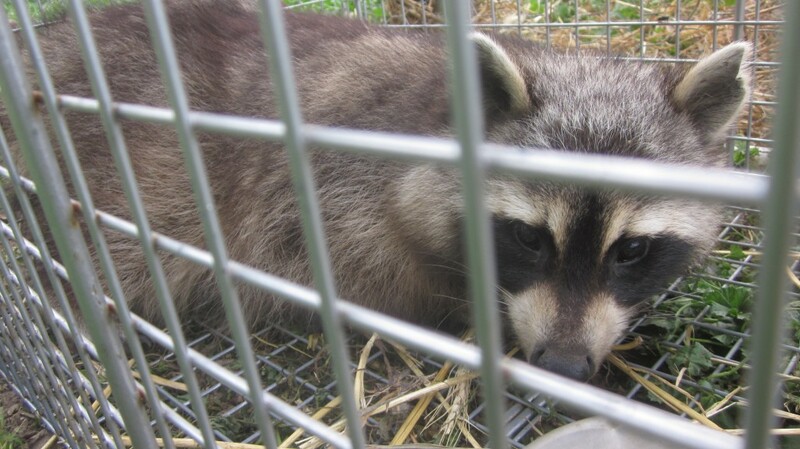 While everyone else is thinking about you taking the hens to market and what delectable Cornish hen recipe to ingest, I was focusing on your visit from Mr. Raccoon. I am glad you haven’t lost any more. I do remember where I grew up in Louisville, KY , my house was near a field, which has since been subdivided) and on occasions the raccoons and other critters would pay us a visit and some times get in our attic not to mention roof or garden in our back yard. BTW we would some times have Cornish hens at home for special occasions. I enjoy reading about your memories, Liz, thank you. In this case, these are not “Cornish hens” but they will be full-grown Cornish Cross chickens. The Cornish hens that you can purchase in the grocery store are the same birds, but they are butchered when they are very, very young. Mine will be full-grown and hopefully 6 or 7 pounds, so will be a good-sized roasting bird. Years ago, when we lived in rural Arkansas and had chickens, we lost chickens several times (one time, my favorite broody hen) to raccoons. I have no love for them and can’t understand people who think they are “cute”. As for your Cornish cross feet – frankenfeet! Yikes! Aren’t those feet amazing!? They have to be stout to carry such a heavy bird around!